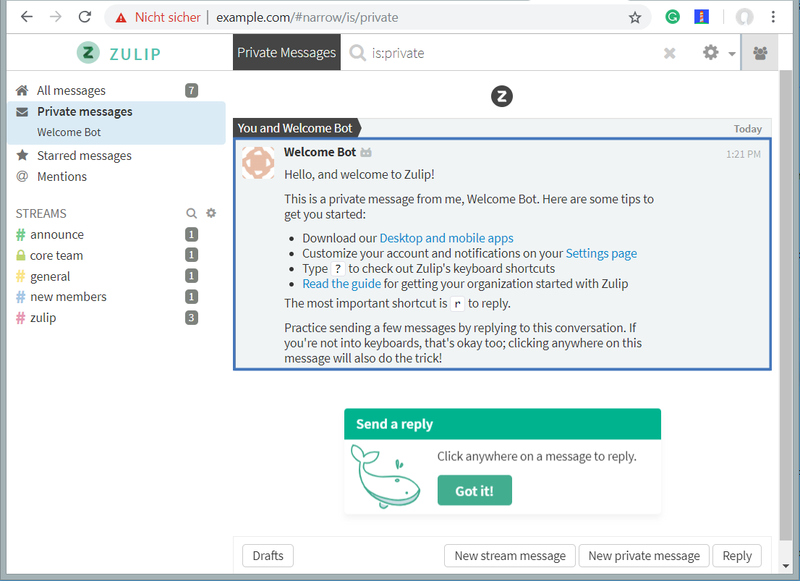 In this tutorial, we will learn how to install the Zulip chat server software on Debian 9. Authors: The Tutorial has been originally written by Hitesh Jethwa and has been updated by Till Brehm in Nov. 2018. A server running Debian 9 server. root access to the server. Once all the packages are installed, you can proceed to install SSL certificate. 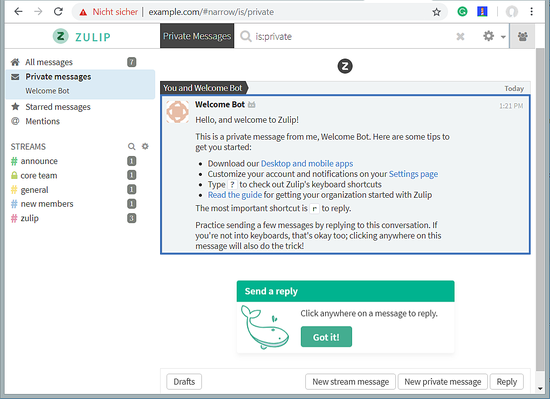 Zulip server works on HTTPS connection, so you will need to generate self-signed SSL certificate or obtain commercial SSL certificate. Here, we will generate a private certificate. Replace the email address and hostname in the above command with your server hostname and email address. Open that link, which is unique for each installation, in a browser to register your Zulip organization. The page will show the text in your local language, so please don't worry that the screenshots below are not in English. Enter your email address and click on the button to create your organization. 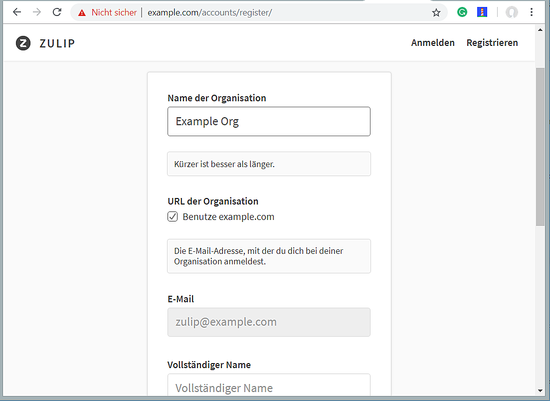 Enter further details of your organization like the name of the organization, email address, your full name and password and click the button to create the account. 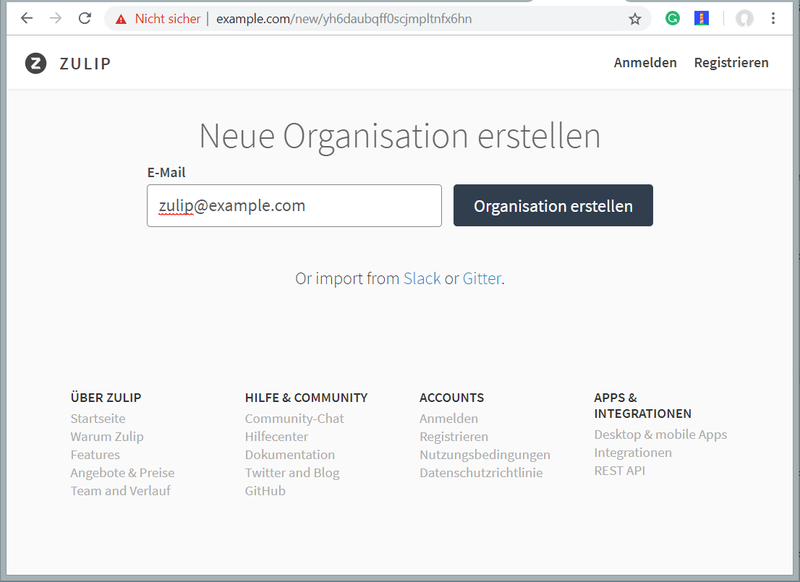 You get forwarded to the Zulip dashboard. Congratulations! you have successfully installed Zulip chat server on Debian 9 server. Curl has been added now. Ubuntu 16.04 LTS "xenial" "
"Running a Zulip server. Setting up a server takes just a couple of minutes. Zulip runs on Ubuntu 18.04 Bionic, Ubuntu 16.04 Xenial, Ubuntu 14.04 Trusty, and Debian 9 Stretch. " But it seems that the link to the Zulip version in the tutorial redirected to an older version now and not latest as the name implied. I've updated the tutorial to use the latest version from GitHub and Zulip install and works fine on my test server on Debian 9 now. Thank you for pointing out the issue with the old link.